Pure quartz crystal singing bowls come in a vast range of sizes - from 3.5 inches in diameter up to 22 inches. The smaller bowls have a higher tone and are wonderful for easy transport. The larger ones become increasingly deeper and more powerfully resonant as they increase in size. All the sizes and tones are excellent for shifting energy, chakra balancing, relaxing, clearing and releasing, as well as for creating a sacred space for deeper connection with your Higher Self. Quite a few people purchase what is called a "Chakra Set". This refers to 7 bowls of 7 different sizes in 7 different notes. Each of these notes has a correspondence with one of the 7 chakras, therefore the name "Chakra Set". Most people, however, begin with one or two bowls. You have a choice of the size and also of the note, which corresponds to one of the 7 chakras. Remembering that the larger bowls have deeper, more resonant tones and the smaller bowls have higher sounds, ask yourself if you are more attuned to higher or lower pitches, and this will help you determine your preferred sizes. We will discuss the choice of notes in a little bit. The 11 to 14 inch Frosted bowls are wonderful mid-range bowls that are not too high and not too low. They are in the octave right around Middle C and are wonderful to tone and chant with, blending beautifully with the voice. (People who begin to work with the crystal bowls often find themselves discovering a voice they never knew they had!) The 11 to 14 inch crystal bowls produce a lot of resonance and sustain, while still being easy to transport and play. The 16" Frosted bowl is also an excellent choice for a single bowl. The 16" is where the bowls begin to move into the really deep tones that are so effective for shifting deeply held etheric patterns that are ready for change. So powerful! And 16" is the size at which you begin to FEEL the pressure waves rolling off of the bowl. You can just feel them going through your whole body and traveling up the striker into your arm. 16 inch is usually G for the Throat or A for the Third Eye. The 8, 9 and 10" Frosted bowls are perfect when you are looking for an easily portable bowl or need to use one in a small space. You get a good note choice in these sizes too, as these sizes are often available in F (Heart), F# (Thymus), G (Throat), G# (Zeal at base of skull), A (Third eye) and B (Crown). The 11" or 12" usually provides tones in C (Root Chakra), D (2nd/Sacral) and E (Solar plexus). The pitch of the bowls deepens as the size increases. Get an 18 or 20 inch singing bowl and you will think that Tibetan monks or humpback whales have moved in with you! These large bowls are especially powerful for taking outside and using in Earth healing ceremonies. Remember that this is quartz crystal and still has its innate resonance with the entire natural world. For three bowls, a great combination is a 10 inch and 12 inch with a 14, 15 or 16 inch Frosted. These bowls provide a beautiful range of tones. Another plus is that these three can nest inside each other for storage, as can any bowls with 2 inches or greater difference in diameters. You can play 2 or 3 bowls at the same time, allowing one to continue resonating as you play another one. This creates magnificent musical chords. And what about deciding which notes to choose? If there are specific notes that you already know that you need, we can advise you which sizes would have those. Not every size comes in every note. The supply changes often. Some bowls are limited editions and sell out quickly, while other bowls are almost always available. The notes that are best for you may also be related to what is going on in your life. Sometimes it is important to work on the higher chakras or energy centers, while other times the most important thing may be a need to stay centered and grounded, or to enhance your creativity. If you would like to see our chart that shows where the chakras are found in the body, and their corresponding notes and colors, there is a link at the bottom of this article, or you can click here now to see the chart. It is also important to keep in mind that although the crystal bowls are labeled to correspond to one of the 7 chakras, there is no way that ONLY one-seventh of your body responds to a crystal singing bowl! Each crystal bowl affects the WHOLE body. Perhaps you will feel the effects begin or express more deeply in one of the 7 chakras, but they will also travel throughout your entire energy field. Knowing this fact takes the pressure out of choosing the right note for your singing bowl. Every tone is wonderful and effective. Many people choose the notes and sizes that sound the best to them when we play several bowls over the phone. Most people are surprised to learn that a particular size of bowl may be available in more than one note or tone. This is possible because subtle differences in the weight, porosity, wall height, and wall thickness of the bowl determine the tone. For example, a 14 inch frosted bowl is often available in A, B, C or D, with the D bowl having a side wall an inch or so higher than the A bowl. The 16" Frosted bowl is often a G or an A note. The 18" sounds as if you are listening to an enormous, clear bell, and there is often a broad note choice in this size, too - D, E, F, or G. The 18 inch is a favorite, because it is so deep and resonant, yet still easy to pick up . Interestingly enough, there are several systems in the world for specifying which tones go with which chakras. The two that I work with are what we'll call the "Traditional System" and the "Cycle of Fifths". The bowls are labeled and sold in the "Traditional" system, in which the First (Base/Root) Chakra is considered to be the Note C. Then the notes move in alphabetical order up the scale: D for the Second (Navel) Chakra, E for the Solar Plexus, F for the Heart, G for the Throat, A for the Third Eye and B for the Crown. In the "Cycle of Fifths" system, F is the Base Chakra, C is the Second, G is the Solar Plexus, and D corresponds to the Heart. It continues with A for the Throat, E for the Third Eye and B for the Crown. (B is the only note that represents the same chakra in both systems.) Again, this is just another system, not the way the bowls are labeled. You are working with the same seven notes, just assigning them to different chakras. The point of bringing up this detail is to reemphasize that there is a lot more going on with each bowl than just the chakra center that it is labeled for. There is even another system in which the notes align with the acupuncture meridians. If you are new to crystal bowls just tune this part out! Really. You don't need these details. They are here for those who want more detail. There is a fine balance here between providing too much information and not enough. Remember that every bowl is truly wonderful and multipurpose. When we conduct crystal bowl meditations, I often use this "Cycle of Fifths" system to work with the chakras of the group members. I have had many confirmations of how effective this system is. Most everyone can really feel the G bowl working on all the stuff that is usually attached to the solar plexus. In this system, the Heart Chakra is the Note D. This note has proven especially powerful for working on people at a distance, uplifting them through helping them connect with the One Heart. In the traditional system, F is the note for the Heart, and this particular tone is occasionally in short supply and has to be saved for the Chakra Sets of 7 bowls. If we do have extra individual F bowls in stock, we will be happy to sell them to you, but they are not discounted, as the manufacturer charges us a premium for them, making their cost more than the regular discount price for the same size bowl. Note D is also very powerful in its role as the Second Chakra in the traditional system, helping to extend the creative role of the sexual center. This chakra is used in the creation of more than new life! It is also associated with all of our creative talents, such as creating and fulfilling our life purposes and passions. The Note D is also assigned to the Kidney Meridian in the Acupuncture System of Notes. The Kidney is where many people store fear, the underlying cause of many behaviors that most of us would like to change! You are probably wondering why there are sometimes fewer F bowls, and it has to do with complexities of the manufacturing process. Sometimes other notes are also harder to produce. When you receive the bowls, they will have labels inside them that correspond to the "Traditional System" of chakra tones. Just remember that they are also much more. Some bowl sizes are also available in the sharps and flats. When someone chooses to work with a full chakra set, they purchase one of each note in the diatonic scale (or one of each tone that corresponds to a piano white key) - A, B, C, D, E, F, and G. The "Perfect Balance Meridian Set" has one bowl to correspond to the tone of each of the twelve acupuncture meridians, so it adds five more bowls - A#, C#, D#, F#, and G#, making a set of 12. These correspond to the black keys on the piano. But let us get back to what most of you are doing, which is choosing one or two bowls. It is a common misconception that there is one size bowl for each chakra or note. Often people call up and ask for "the third eye chakra bowl". Right now, as I write this, we have the third eye chakra, the note A, in at least 5 sizes of 8, 10, 12, and 16 inch Frosteds and 6 inch Clears! These A bowls are in two different octaves, so the most appropriate one would be determined by how deep a tone the customer wants, as well as by their budget and room space. Any choice you make will be a good choice. It comes down to what you like when you hear the bowls, what your intuition tells you to do, what is available, and how much you want to spend. It is also easy for me to tune in to what's optimal for you now. If you are magnetized to work with sound through the crystal bowls, your Higher Self knows which direction to guide you. Your choices do not need to be "logical" or based on how the notes correspond to the chakras. Sometimes your Higher Self has a much more enlightened plan for you than your brain currently perceives. I like to say that I have never met a bowl that I didn't like. Big ones, tiny ones, clear or frosted, they all create magic. And they are just beautiful to experience! Plus, the more that you work with the bowls, the more you will be connected to Sound, the essence behind Creation, the Word. Most of us have only a small amount of pure, clear sound in our lives. Our ears no longer get a daily exposure to running streams, bird songs, and the rustling leaves in the forest. We are too often inside, with these beautiful sounds replaced by the hum of computers, the whoosh of the air handler, and the high-pitched whine of fluorescent lights. We grow accustomed to tuning out these sounds, along with construction, traffic, crowds, and commercials, so that they do not intrude into our space. Since we don't have "earlids" to close, we shut the sound out with our minds, which can get to be an unhealthy habit that extends to tuning out beneficial sound, too. The pure sine waves of sound that ring from the crystal bowls wake up our ability to listen and hear. Hearing occurs with more than our ears. Sound is vibration, and that vibration moves throughout our body. With the crystal bowls, we feel the sound as much as we take it in with our ears. Many people at our crystal bowl meditations report the presence of sensations in the chakra energy centers, often as a tingling. The singing tones of the crystal bowls also feel and sound so angelic, that I find that it is not possible for me to be in a stressed-out mood, once I start to play one. You can play a bowl before you meditate, to clear and align the chakras and bring you into the "eternal now." They are excellent to amplify the power of essences and aromas placed in the bowl, as well as for making flower and gem essences in the pure quartz. The pure sound sweeps unbeneficial energy from homes and offices. Take them to group meditations and workshops. Play them outside in nature. For those of you who work with clients on massage tables, we have found the bowls to be the ultimate tool for clearing tables, as the crystal sound penetrates foam and vinyl. Using sound with your clients also enables them to make amazing energetic and core-belief shifts, including emotional releases. Frosted quartz bowls are quite sturdy and may be left out on display, easily accessible for use at any time. Their weight and size make them very stable. Several frosted bowls sitting on their rubber o-ring bases can be played at the same time. You can arrange them in an arc around you, allowing one or two to resonate while you ring a third. I like to play my bowls standing up, and I keep about 8 on a dining room table in 2 rows, which makes it easy to reach all of them. Frosted bowls also vibrate with a long, powerful sustain. They may be played with two kinds of strikers, which are the suede striker included with each bowl and the optional rubber ball mallet, which provides a different tonal quality and is a little easier on the arm during extended play. Another style is the "Clear" crystal singing bowl. These beautiful bowls are much lighter in weight than the Frosteds, and all of them, from 6 to 10 inches in diameter, can be held on the palm or fingertips to play. I like to make the analogy that the weight difference in the clear and frosted bowls is like the difference between a coffee mug and a wine glass. 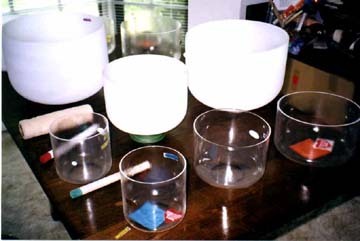 These clear bowls have much thinner walls and bases. This property also gives these bowls a somewhat more bell-like or angelic tone. Despite their delicate appearance, my experience has shown these bowls to be just as durable as the frosted ones. My 9 inch C# clear bowl that I have had for ten years is still in perfect condition. A new bowl style is the beautiful Optically Clear Walkabout bowl. These enable you to walk about while creating the enchanting sound that only a pure quartz crystal singing bowl can provide. There are currently sizes of Optically Clear Walkabout crystal bowls from 5.75 inches up to 8 inches, with sizes in various increments, such as 6.25 inches or 7.5 inches. They all have a pure quartz crystal handle fused to the base of the bowl. Not only can you move about freely with these bowls, but you also gain the benefit of feeling the sound travel up both your arms - the arm that is holding the crystal handle and the arm using the striker. Whenever we are playing a bowl for the benefit of others, we are, of course, giving ourselves a tune-up in the process, as the pure vibrations enter our bodies! Please also click on our full page we have written about these beautiful bowls. The same manufacturer who originated and trademarked the term Chakra Tuned Quartz Crystal Singing Bowls, the bowls that we provide to you, produces these new Walkabout bowls. You can use any of the bowls to cleanse the energy in a room in the same way that sage is used. For example, I walk to each area or person, ringing the bowl. This is fabulous for situations where you cannot use burning sage. It is an excellent way for body workers and therapists to purify the energy of the room between clients. This works really well in our homes, too, where sometimes we need something extraordinarily powerful to get out those angry words left hanging in the air! Another reason that the crystal bowls are remarkable for clearing is that their pure quartz crystal matrix allows them to powerfully amplify your intention. Learning to play a quartz crystal singing bowl takes less than one minute. Of course, technique improves with playing. I make it easy for you to get started by sending detailed instructions describing the proper striker grip and angle, the best position for your arm and wrist, and how to find the correct striker speed and pressure. We are happy to answer questions both before and after you purchase your bowls. And if you happen to find a lower advertised price, we will do our best to give you an even lower price. A quartz crystal bowl is a wonderful gift to yourself and to all those who will experience it with you. It is the gift of pure sound combined with pure programmable quartz. It is time for the fullness of Sound. We look forward to providing you with your own "Singing Rainbow".